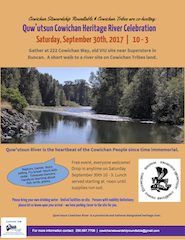 Thanks to the Cowichan Tribes and the Canadian Heritage Rivers Society for making this event possible. One of the most remarkable river restoration projects in Canada. The challenges of the project were daunting: divert a one kilometer stretch of the Cowichan River; dry out the channel; move over 40,000 cubic metres of river sediment, keep 30,000 stranded fish alive; , bypass over 3,000 river recreationalists during the summer, and return the river post-project to its original course. This Restoration Project stabilized the Stoltz Bluff over the Cowichan River. This silt bluff was eroding over many years and releasing massive amounts of fine sediment into the river. This erosion resulted in the destruction of critical fish habitat and spawning grounds and adversely affected water quality downstream. The survival rate of Cowichan Chinook Salmon and Steelhead was less than 6% in some years and these species were in danger of not achieving biological replacement. A coalition of local partners used the heritage river designation of the Cowichan to help mobilize community and financial support from a diverse range of stakeholders. The partnership roundtable for this project was facilitated by the Cowichan Stewardship Roundtable and included active participation by Cowichan Tribes, federal and provincial government agencies, industry, NGO and community representatives.